February 5, 2016 – On this Friday before Super Bowl 50, we’re going to focus on the name etched into the victory trophy: Lombardi. 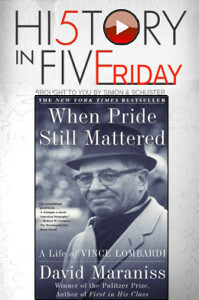 Best-selling author and historian David Maraniss shares five key facts about the NFL’s greatest coach from his biography, When Pride Still Mattered: A Life of Vince Lombardi . If you’d like to hear more about the history of football this Super Bowl week, catch our interview with John J. Miller, author of The Big Scrum: How Teddy Roosevelt Saved Football . It’s the story of how the Rough Rider reformed the game, at a time when — as with today’s concerns about concussions — some were calling to ban the pigskin pastime. It’s the perfect way to kick off your modern weekend, with people from the past.